Today's swap book is this buttonhole binding by Jennifer, of Tickerfinch.Etsy.com. 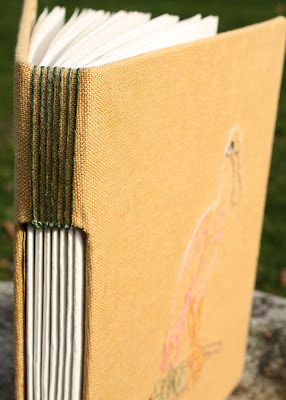 Jennifer's buttonhole journal is made with "mustard colored linen with green Irish linen thread. 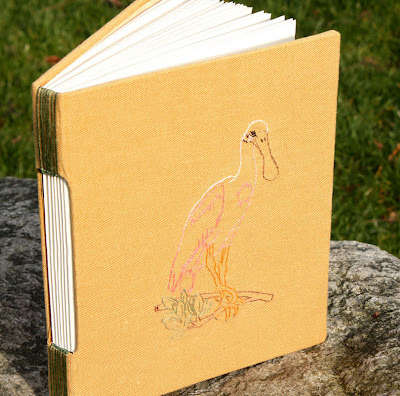 The bird, a Roseate Spoonbill, was hand embroidered in linen threads. The endpapers are pages from an old botany book - one of the pages was filled out by hand in 1898. The other gives descriptions of botanical terms. The spine lining is waxed, multi-colored paper from India." Check out Tickerfinch on Etsy to see more of her work. See all the books from Book Swap #10. Fun book! That is some impressive embroidery! I got this one!!! :) I love it! It's my new drawing and ideas notebook. Thanks, Jennifer!